Planning your trip to Prague in February or you´re already here and wondering what to do when the weather is not exactly inviting? ActiveCzech.com has selected some of the most interesting and exciting things to do in Prague and around while the winter is still making our teeth chatter. Enjoy a calm river cruise with your loved one, glasses of sparkling wine and a rose for the lady. Spend the most romantic day aboard with stunning views of Prague. Try out our special Valentine´s day skydiving simulator offer for 2. Watch an icefall towering above you and conquer it. 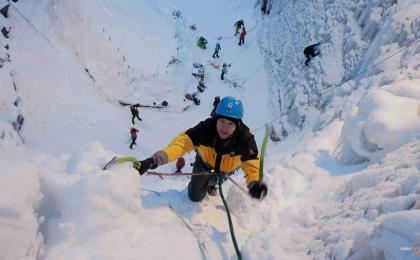 Become an ice climber during this 3-hour ice climbing course. The winter won´t stop you from working on your surfing skills. Grab the board and enjoy indoor surfing while in Prague.Want to try? Order your own Prague indoor surfing experience. Want to hit the slopes for a day? 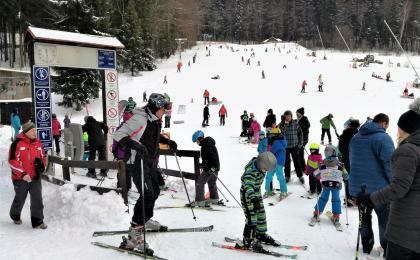 Let´s go for a day trip to Czech mountains and enjoy a day full of skiing, snowboarding or ice-climbing. Try one of our most popular winter activities and visit the Prague indoor shooting range. Get familiar with the most common types of guns and hit the bull's eye. The ending winter in Prague isn´t very busy and most locals kill time by going to theatres and museums. You won´t make a mistake by choosing a play or an opera from the programme of the National Theatre (we recommend a traditional Verdi opera with subtitles) or visiting an exhibition prepared by the Prague National Gallery. The collection of medieval art at the Convent of St. Agnes of Bohemia is one of its jewels. Modern art lovers should visit its exhibitions in the functionalistic Trade Fair Palace. For those who prefer some more progressive art forms, go out for a night at the legendary Cross Club - a 3-storey experimental space filled with cyber punk decor, that is continuously modificated, and everyday concerts, shows and DJ performances mostly with free entry. Another great venue is the Roxy club in the city centre with its weekly Free Mondays. February is also the time when the Slavic carneval takes place around the country. In 2017 the so called “masopust” starts around the 19th of February and is celebrated by mask parades, parties and pig-killing, when family and friends come together to process the pig´s meat and prepare traditional dishes as tlačenka, prejt or prdelačka - a soup make of pig blood. Yummy :-) The best place to experience the carneval while in Prague is the Žižkov quarter with its very own Žižkovský masopust. Skiing enthusiasts can take a day trip from Prague to the mountains and enjoy snowboarding, skiing or ice-climbing. If you wish to try something really crazy, stay with your gear in Prague and use the cable car at Petřín hill as a ski lift, then ride down on a bobsled or your regular snowboard or skis. If you don´t want to leave the city, there are still great things to do - go out and test your shooting skills at a Prague shooting range, take your friends for an indoor paintball battle or choose one of the many escape room games all around Prague. ActiveCzech also offers you a unique rafting or indoor surfing arena experience in the winter months. Coming to Prague in February with your loved one to celebrate Valentine´s day? Enjoy romantic sighseeing flights, romantic chateau stays with spa treatments and local cuisine experiences. Our special tip for Valentine´s day is to book a night at the One Room Hotel right at the top of the Žižkov Television Tower 70 meters above the ground with magnificent views. If you´re a very active couple, try out our special Valentine´s day skydiving simulator offer for 2. 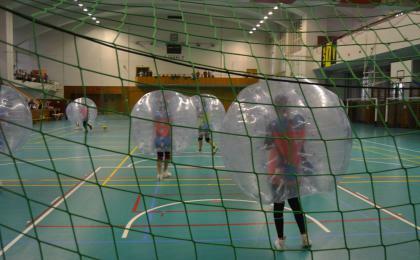 And that´s just some of the activities you can enjoy in February on your trip to Prague. Check out our full catalogue of Prague and around experiences that will make your February stay in the Czech Republic unforgettable. Žižkovský masopust: The best place in Prague to celebrate the Slavic carneval is at Žižkov. The event starts on the 25th of Febraury at Náměstí Jiřího z Poděbrad with a fair and musical programme, on the 26th the pig-killing takes place at the famous “U vystřelenýho voka” pub and the day ends with a traditional Czech music concert at the Akropolis Palace club. On the 28th a great carneval parade passes through the city quarter with fireworks and partying at the end. Let it roll Winter 2017: The winter edition of one of the most popular summer electronic beats festivals. Sign up for any of its Beats Evolution Workshops to get some of the newest drum n´bass tips and tricks from fellow DJ´s. La Pelicula 2017 and other film festivals: Watch some of the best new Spanish speaking movies at the Světozor art cinema or enjoy the BIO OKO sci-fi Future Gate film festival.